Start Winning Bowling with Hypnosis! Bowl better than ever with this powerful self-hypnosis mp3 by Steve G. Jones! Discover your true bowling potential like never before, and get the edge over your opponents! Improve your abilities with an effective secret weapon: Hypnosis! It’s easier than you think with the Winning Bowling Hypnosis MP3. Imagine having the power to be as successful as you’ve dreamed!!! Have no time to “spare” working on your bowling score? The Winning Bowling Hypnosis MP3 is the answer to improving your bowling game and you can do it in a way that won’t take up any time during your busy day. Hypnosis is done just as you drift off to sleep. So instead of reading or watching television, you can be listening to a self-hypnosis program that will make good use of the brief time between awake and asleep. Once you have entered a deep state of relaxation, the hypnosis process goes to the script stage. It is here that desired behaviors and outcomes are introduced and reinforced. Messages affirming such truths as “you will have confidence, perfect form, concentration, etc,” are all parts of the script that may be spoken in order to bring about changes in your actions once you are brought out of the hypnotic state. 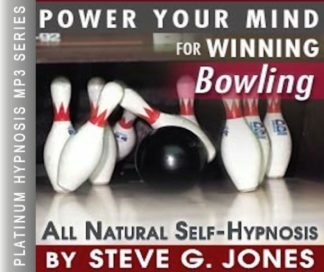 Steve G. Jones is a clinical hypnotherapist who has developed the Winning Bowling Hypnosis MP3. Here, a script is devised specifically for improving bowling skills and confidence. It will lead the listener to develop their own winning strategy and carry it out. Steve G. Jones, Ed.D., Clinical Hypnotherapist, charges $1,500 for a custom recording and $25,000 for a one-hour private hypnotherapy session at his office. But you can get all the benefits for this low price. Simply listen to the Winning Bowling Hypnosis MP3 audio every night as you go to bed for three weeks and feel the changes happening in your life. You will feel more empowered, more in touch with your true self, and you will truly know that your goals are within your reach. Steve G. Jones achieves AMAZING and LASTING results!!! Hypnosis is the easiest way to affect change in your life because the positive messages go straight to your subconscious mind effortlessly so you can accomplish your goals and reach for the stars!! All you have to do is listen to the Winning Bowling Hypnosis MP3 download at night as you go to sleep!!! You’ll hear soft music, the gentle sounds of the beach, and the soothing sound of Steve G. Jones’ voice all working together to bring about positive changes in your life easily and naturally. Steve G. Jones has been helping people improve their lives with hypnosis for over 17 years…now it’s time for him to help YOU… don’t wait, do it NOW !!! you’ll be glad you did. See you at the top! And as you relax more and more, drifting, floating, deeper and deeper and more deeply relaxed, you imagine yourself now standing, standing tall, standing at the lane. You have positioned yourself perfectly, that’s right. It is the first frame. You see all ten pins and you are very focused, focused on the pocket. You realize that you have prepared yourself. You have the necessary skills to hit the pocket perfectly. And now as you approach to the line, you draw your arm back and release the ball at the line, smoothly. And you watch as the ball goes to the pocket, strike. You feel wonderful and you imagine yourself now in another frame, relaxed. You see all ten pins in front of you. Standing tall, so very focused, it’s almost as if the only things which exist in the universe are those ten pins. And you see the pocket. You see where the ball needs to go. And as you now make your approach to the line, drawing your arm back and releasing smoothly from the line, you watch as the ball goes to the pocket, strike. You are able to bowl a strike any time you choose simply by focusing on the pocket. I’d like you now to imagine that it is time to pick up a spare. And you can imagine this spare to be any configuration you choose because they are all very easy for you. You stand tall, very confident. You understand exactly where the ball needs to go and as you now make your approach to the line, drawing your arm back and releasing smoothly at the line. You watch the ball go exactly where you need it to go. And you pick up the spare easily, easily. Day by day you are becoming a better bowler. People notice your abilities. They realize just how skilled you are. And you are becoming more skilled now. Allowing yourself to bowl perfectly. Allowing yourself to win. Allowing yourself to raise your high game. Allowing yourself to raise your average. Allowing yourself to improve every time you bowl and between games, you improve by mentally going through your strategy, by imagining yourself bowling, hitting the pocket, picking up spares, easily and effortlessly. And this mental exercise contributes to your bowling skill. Allowing you to become a better and better bowler day by day, even during those times you are simply imagining yourself bowling. So relax now and understand that you are becoming a very, very, very good bowler day by day. Achieving a level of excellence in your bowling. Your bowling is outstanding. Bowling is an exciting and skillful sport that you can improve with hypnosis! The key to this hypnotherapy session is visualization. Visualizing bowling a perfect game will help you become a better bowler. This powerful hypnosis session will give the confidence you need to win at bowling. Whether you are a professional bowler, part of a bowling league, or you want to improve your bowling game with friends, hypnotherapy will help you win at bowling! We suggest you listen to this Winning Bowling Hypnosis MP3 recording on a nightly basis for 21 nights in a row. You may begin to see results in your bowling game after the first session! The suggestions from the Winning Bowling hypnosis MP3 will give you the mastery you have been looking for in your bowling game!